Preferred Habitat: Woodlands and suburbs. Seasonal Occurrence: Common winter and spring. Occasional in the fall. Profile by Vicki Stittleburg: Cedar Waxwings are stunning birds; both males and females look alike. They have brown upperparts and a cinnamon crest. The belly is pale yellow and the tail is gray with a bright yellow band at the tip. The face has a Zorro-like mask neatly outlined in white. The name "waxwing" is derived from the bright red tips of their wings which look like they have been dipped in colored candle wax. The older the bird, the more showy the red tips. Common in winter and spring, flocks of Cedar Waxwings will descend on any open woods and parks, rural or suburban, with a lot of berry-bearing shrubs. The Cedar Waxwing is one of the few North American birds that specializes in eating fruit. Since they eat so much fruit, Cedar Waxwings occasionally become intoxicated when they ingest overripe berries that have started to ferment. Planting mulberries, juniper or yaupon shrubs can attract this bird to your yard. 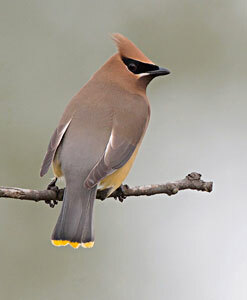 Cedar Waxwings call often, especially in flight. Listen for their high-pitched, trilling calls in woodlands and suburbs.